Tonight the local Chicago PBS station will premiere a new program – Biking the Boulevards. As noted by the Active Transportation Alliance, narrator “Geoffrey Baer explores Chicago’s Boulevards on a bike and reveals some of the rich history behind Chicago’s cycling community.” If you’re in Chicago, consider joining your fellow cyclists to watch this program tonight – details available from Active Trans. I’m excited that Chicago’s PBS station WTTW is bringing this bike-based tour of Chicago to the community, especially after reading about how PBS excluded a mention of the bicycle in its recently released documentary about transportation called Beyond Motor City. 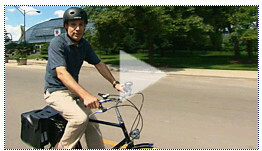 WTTW invites you to “join Geoffrey Baer as he bikes across Chicago using a network of boulevards and takes a new look at old neighborhoods that emerged along these boulevards in the 19th century.” Watch Biking the Boulevards tonight at 7:30 and 9:30 pm (CST) on WTTW11! You may even share your story, explore the interactive map, buy a DVD, and watch clips on their website for this Biking the Boulevards program. Not so much about biking as about Chicago history. However, “wheelmen” play an important part in Chicago history. Very, very interesting for this former Chicagoan. Available online. Weird music problem in parts 4 and 5. I wouldn’t have known about this show if it wasn’t for this site! Thanks!